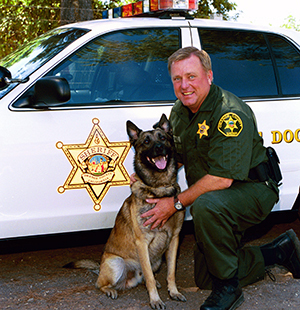 Countries around the world recognize the services of their working dogs in both the military as well as federal and law enforcement agencies. Great Britain, for example, awards the Dickin Medal to honor the work of animals in war, and now, in times of terrorist events such as 9/11. 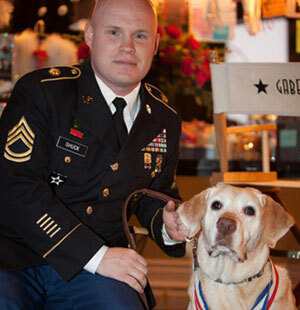 At present the United States does not have a mechanism for honoring these canine heroes. During WWII, medals such as the Purple Heart and the Bronze Star were awarded to military dogs that have performed heroic service. Unfortunately, these awards were later rescinded. The thinking at the time was that awarding a medal to a canine would somehow be demeaning to servicemen. 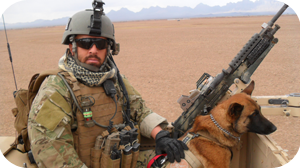 K9s of the War on Terror, Inc., recognizing this injustice, intends to honor canines that have demonstrated exceptional acts in the War on Terror. The medal will be known as the ‘K9 Medal for Exceptional Service’. 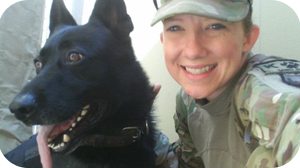 The medal will be awarded to those dogs serving in the United States Military, the U.S. Department of Homeland Security, and Law Enforcement on the federal, state and local level. The awarding of this medal by a civilian group has a counterpart in awards presented by organizations such as the U.S. Navy League and the U.S. Marine Corps League. The purpose of this medal is to recognize canines, who, alongside their handlers, have performed exceptional acts of service in the War on Terror and in the defense of this country. The awarding of this medal, which began with the War on Terror, is intended to continue long into the future as a tangible means of recognizing the accomplishments and sacrifices of our Military, Government and Law Enforcement K9 teams long after the War on Terror has concluded. The start date for consideration for this award is September 11, 2001. Canines who made significant contributions since this date may also be honored posthumously. The following requirements must be met for a canine to be considered for the ‘K9 Medal for Exceptional Service’. The act or service must have been documented by the canine’s organization or department. This documentation should be included with the application for consideration for presentation of the medal. Should the act or service be of a classified nature, a letter from competent higher authority may be written, describing the event but omitting sensitive details. Application for consideration of this medal does not require the canine to be living. An application submitted for a living or deceased canine will be weighed equally. Applications shall be reviewed by a Medals Committee, whose members come from within the K9s of the War on Terror, Inc., Law Enforcement and professional individuals. Applicants will be notified of their status or need for further information within a reasonable time period after receipt of application. 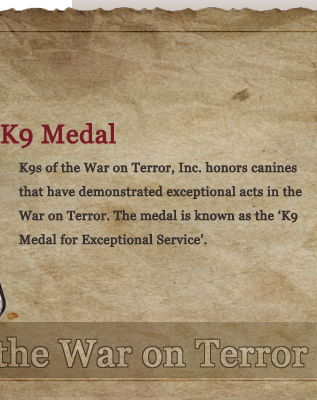 The K9 Medal for Exceptional Service has been uniquely designed for presentation to canines. Measuring 3 inches in diameter, the medal is meant to be hung from the collar. A slightly smaller version of the medal, in medallion form, will be presented to the canine’s handler. 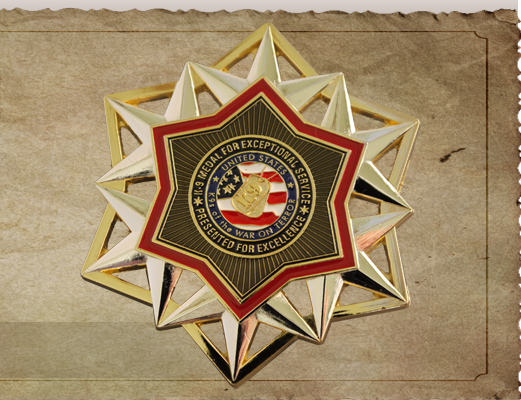 The K9 Medal is a unique one-of-a-kind decoration that has been specifically designed for presentation to canines. The medal is a 3 inch diameter metallic medal designed to be hung from the canine’s collar. 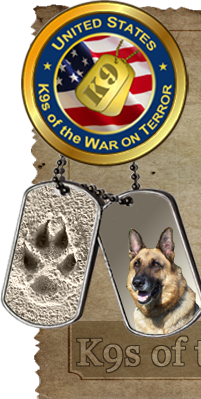 Center of Medal – Logo of the K9s of the War on Terror, the presenting organization. Surrounding the logo – The wording ‘Medal for Exceptional Service’ and ‘Presented for Excellence’. The six pointed black star with gold rays represents the day and night operations of the canine teams. The red border represents the canines that have been killed in the line of duty. The eighteen silver points represent the aggressive nature of the work that these canines perform as part of their daily lives. 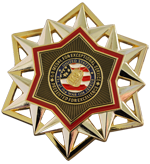 The gold border connecting the silver points represents the protection and security the canines provide for the United States in this War on Terror. The name and serial number of the canine, as well as the date of award will be engraved on the reverse of the medal. Accompanying the presentation of the medal is a 2 inch diameter medallion which is presented to the handler along with an award citation. The face of the medallion is a copy of the K9 medal for Excellence and the reverse allows for an inscription documenting the canine, the handler and the date of presentation.